The Viper AS5160T is a highly productive walk-behind scrubber dryer with battery endurance and tank capacity to clean for hours. Being easy and comfortable to use with the ergonomic design, this robust machine is ready for an in-depth performance on indoor surfaces. Ideal for cleaning in hotels and restaurants, bus and train stations, factories, supermarkets, shopping malls, hospitals, schools, and other public areas. 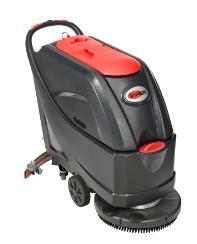 With a working width of 51 cm and a powerful 450 W brush motor, theis machine will get the job done with speed and ease. Equipped with a 150 W Traction drive motor. Hours of non-stop cleaning are ensured by the 61 litre capacity of both water tank and recovery tank – and the power packed 2x12 Volt batteries. The machine is well-balanced and easy to manoeuvre thanks to the big wheels and strong casters. Hour meter and water level indicator will keep you updated, and the speed reducing gear drive system ensure smooth operation with a minimum of effort. When it’s time to empty, refill and clean the scrubber dryers, all handling can easily be carried out, saving time and costs.